My first task this morning was to ring British Airways to see if I could get on the direct flight to London. Ever since I had booked to come to Nassau, the flight had been full, and at this stage I only had a confirmed seat on tomorrow’s American Airlines flight to London via Miami. The BA sales agent told me my chances of getting a seat were very slim. The flight was fully booked and there were several on the waiting list ahead of me. She said there would be little point going to the airport on the off-chance of getting a seat. So I am stuck in the Bahamas for an extra day – I suppose there are worst places to be stuck. After breakfast I walked down the road to Dollar Rent-A-Car to see if they had a car available for the day. I thought I should at least use the opportunity to see a bit of the island. The woman behind the counter told me she had a little Chevrolet Aveo available which I could have for $59 for the day. That sounded reasonable. I handed over my Malaysian driving licence and credit card. She said I was the first customer from Malaysia that she had served in 20 years of working for car rental companies in Nassau. I set off at about 9 am. The car was pretty clapped out, but New Providence is not a big island, so I wasn’t expecting to have to do any fast driving. The main problem was that the steering wheel was on the left (like in the US) but in the Bahamas they drive on the left (like in the UK) so overtaking was likely to be more difficult. I also had problems getting the car into reverse a lot of times. It had an electronic gear shift which I was told you just push back until it beeps, and it changes gear. But it didn’t always beep so kept going forwards when I wanted to go back. It took me only about two hours to drive right around the island, and that included a stop of nearly an hour at an abandoned resort on the south side of the island. There really wasn’t much to see. New Providence has half a dozen or so gated communities where all the wealthy Americans live, a couple of marinas – which again you couldn’t go into unless you are a resident – and the rest was just an unattractive sprawl of concrete block houses, small holdings and vacant land on which there had been a lot of indiscriminate dumping of rubbish. Outside of the gated communities, the marinas and the resort hotels along the northern beaches, the rest of New Providence looked very poor. The shops by the side of the road had heavy grilles over their doors and windows – suggesting a local crime problem – and the only activity on a Sunday morning outside of downtown Nassau seemed to be people going to church. And there were lots of people doing that – all dressed in their Sunday best. Most of the churches looked like Baptist or Anglican churches, but there were also some Methodist, ‘Church of God’ and other evangelical places that I saw. 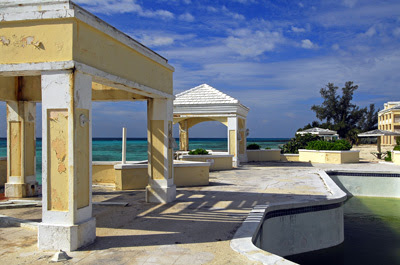 The abandoned resort that I stopped at on the south side of the island was called South Ocean Beach Resort. I read that it had closed down the previous year (but couldn’t find out why). There was a big sign out the front warning people to stay out of the resort, but there was nobody around so I cautiously edged my way in taking photographs as I went. I had seen nothing all morning that was worth photographing, but the abandoned resort made for some interesting pictures – the empty buildings and courtyards eerily quiet. I later looked up the resort on the Internet, and on some sites like MSN Travel, it was still listed as taking bookings. 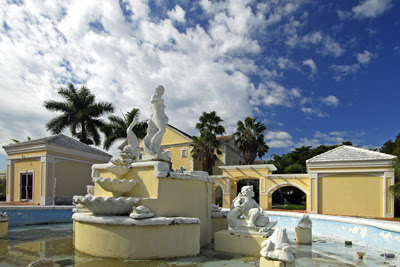 MSN Travel said: "This 195-acre resort is located as far away from downtown Nassau's traffic jams and cruise-ship shopping crowds as it's possible to get on New Providence Island. Vacationing families and couples sunbathe, swim, and play golf in a lush, green tropical setting. A 1,000-foot beach of nearly white sand lapped by the turquoise Atlantic Ocean offers hammocks, wood sun shades, and a volleyball net. 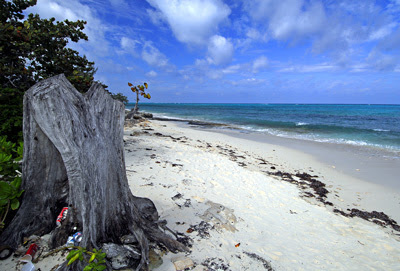 The resort's beach is much less crowded than those at bigger Nassau resorts". Yes, the wood sun shades are still there, but the hammocks and volleyball net are gone, as have the vacationing families and couples. The one thing that is still right about MSN Travel’s description is that the beach is much less crowded than those at other resorts – in fact the beach was completely deserted when I was there and I didn’t see another person the whole time I was at the resort. As I sat on the terrace by the empty swimming pool, overlooking the ocean, it felt like the rest of the world had disappeared and I was the only person left. A strange feeling. After my picture taking at the abandoned resort I completed the trip around the island, stopping only at Orange Hill Beach on the north side of the island. Again, I was the only person on the beach, but I didn’t feel quite so isolated because it backed on to West Bay Street and there were a few cars passing by. What disappointed me about Orange Hill Beach was the amount of rubbish strewn in the bushes and behind tree stumps at the back of the beach – empty beer bottles and KFC containers mainly. I would have thought that in a place like the Bahamas, which is so reliant on the tourist industry, the locals would do a better job of looking after their beaches. The other disappointment that I had from my drive around the island was the apparent disregard for the environment. 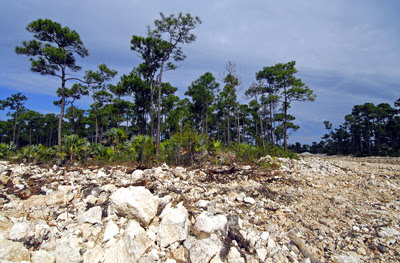 Apart from rubbish everywhere, building development is very haphazard, and the few remnants of what looked like native vegetation (a combination of a species of pine tree with clumping fan palms growing below) were being bulldozed away to build condos and houses. 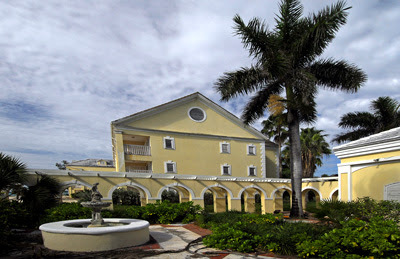 What you see on the tourist brochures for the Bahamas is only the ‘beautified’ parts of the island around the tourist resorts and gated communities. That probably wouldn’t account for more than 5% of the islands. The other 95% feels like a very rundown Florida backwater. Throughout the Bahamas you see real estate ads, urging tourists to buy their ‘own piece of paradise’. But it’s not a place I would like to live. There are hundreds of places in south-east Asia that are more beautiful – and more natural - than the Bahamas. Jan 26 Another day, another island . . .